12 Nobel laureates, 15 other eminent citizens call upon UNSC in open letter. Sep 14 2017 - Twelve Nobel laureates and 15 other eminent global citizens yesterday urged the UN Security Council to intervene immediately to end the humanitarian crisis in Myanmar’s Rakhine state. “We call on UNSC to intervene immediately by using all available means. We request you to take immediate action for cessation of indiscriminate military attack on innocent civilians that is forcing them to leave their home and flee country to turn into stateless people,” they said in an open letter to the president and member states of the UNSC. The move comes at a time when around 3.7 lakh Rohingyas fled Myanmar Army’s crackdown in Rakahine in the last two weeks and entered Bangladesh. More are expected to come while some 87 are estimated to have died in boat capsize on their way across the Bay of Bengal. The signatories of the letter thanked the UNSC president and member states for holding the UNSC meeting on Rohingya crisis yesterday. They urged the UNSC to persuade Myanmar government to take immediate steps to implement the recommendations put forward by the Rakhine Advisory Commission that Myanmar itself established last year under the pressure of the international community. The Advisory Commission, comprised of mostly Myanmar citizens and chaired by Kofi Annan, recommended providing citizenship to the Rohingyas, allowing them freedom of movement, rights and equality before the law, ensuring communal representation, lack of which affects Muslims disproportionately, and facilitating UN assistance in ensuring safety and security of returning people. To implement the recommendations, the signatories suggested reappointing the commission members immediately to constitute an Implementation Committee to oversee the implementation of the recommendations, taking immediate steps to stop the outflow of Rohingyas, inviting international observers on a regular basis to visit vulnerable areas, taking back the refugees and building camps within Myanmar to rehabilitate Rohingyas upon their return with UN financing and supervision. Of the signatories, 10 Nobel peace laureates are Prof Muhammad Yunus (2006), Betty Williams (1976), Oscar Arias Sánchez (1987), Shirin Ebadi (2003), Tawakkol Karman (2011), Máiread Maguire (1976), Archbishop Desmond Tutu (1984), Jody Williams (1997), Leymah Gbowee (2011), Malala Yousafzai (2014), and two Nobel laureates in Physiology or Medicine — Sir Richard J. Roberts (1993) and Elizabeth Blackburn (2009). 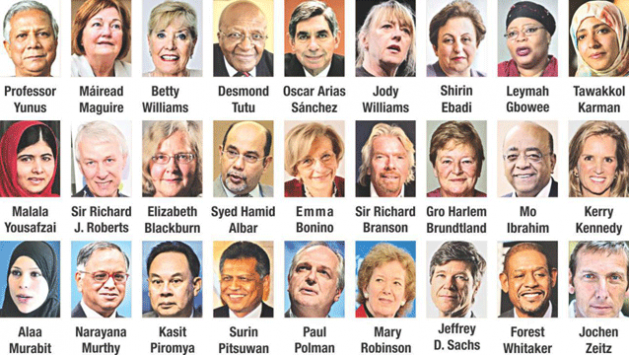 Apart from them, 18 eminent global citizens — former Malaysian minister for foreign affairs Syed Hamid Albar; business leader and philanthropist Sir Richard Branson; entrepreneur and philanthropist Mo Ibrahim; Voice of Libyan Women and SDG advocate Alaa Murabit; former Thai foreign minister Kasit Piromya; business leader and SDG advocate Paul Polman; director of the UN Sustainable Development Solutions Network Jeffrey D. Sachs; business leader and philanthropist Jochen Zeitz; former Italian foreign minister Emma Bonino; former prime minister of Norway Gro Harlem Brundtland; human rights activist Kerry Kennedy; business leader Narayana Murthy; former secretary-general of ASEAN Surin Pitsuwan; former president of Ireland Mary Robinson; Actor and SDG advocate Forest Whitaker, actor and activist Shabana Azmi; poet and lyricist Javed Akhtar and former chair of Human Rights Commission, Pakistan Asma Jahangir singed the letter. “The human tragedy and crimes against humanity unfolding in the Arakan region of Myanmar need your immediate intervention. This is one of the decisive moments when bold and decisive actions are needed promptly when it is still possible to get it resolved,” they said. According to different organisations, the recent military offensive by the Myanmar Army in Rakhine state has led to the killing of hundreds of Rohingyas and hundreds of thousands displaced. Referring to the huge influx of Rohingyas into Bangladesh, the eminent personalities in the letter said human misery created by such massive displacement of men, women and children under the threat of death is getting worse every day. “Some of us denounced the previous spate of violence late last year and wrote to you to intervene. However, the situation has not improved. We urge you to take decisive actions to stop the violence against innocent civilians and bring permanent peace in Rakhine state. The Nobel laureates and other luminaries joined the Secretary General of the United Nations in re-emphasizing that the grievances and unresolved plight of the Rohingya have festered for far too long and are becoming an undeniable factor in regional destabilisation. The authorities in Myanmar must take determined action to put an end to this vicious cycle of violence and to provide security and assistance to all those in need. Propaganda and incitement of hatred and all violence, particularly state violence against Rohingyas, must stop, discriminatory laws and policies must go and the recommendations of Kofi Annan’s commission must be implemented immediately, they emphasized. The world is anxiously waiting to see that the UNSC is playing its role to bring an end to a humanitarian catastrophe and build peace in the region, they summed up.